WHAAAAAAAAAAAAA. Not leaning on anything, just supporting your own weight and balancing on your arms? You're amazing, sontaikle! Okay, so apparently I shouldn't do heavy deadlifts more than once a week. I learned my lesson (either that or I need to build up some more strength). Ouch. My back doesn't like me right now. My lower back hates me today. I decided yesterday would be a good day to try to PR deadlifts. I didn't (Grrrr) because I'm pretty run-down right now and very much in need of a break this weekend (Whoot whoot... VEGAS!!) and now my back hurts. Suckage on both counts. The really crappy part is that was yesterday's workout, so the DOMS won't even REALLY hit me until tomorrow... when I have CrossFit. Awesome. Good thing I have a massage afterward. I'm assuming she means balanced on the wall (that's how we do them in XFit anyway) - but if she's rocking them totally unsupported that's badass! My back is a bit better now, but still sore. I was going to go to my bootcamp class tonight but I'm skipping it to just give my back a bit more rest. I'm doubling up tomorrow though: boot camp in the AM and then Weights in the evening. I think that Friday to Monday just wasn't enough of a rest between those heavy deadlifts. Next time I'll just do the heavy stuff on Friday and do lighter ones on Monday (or different exercises altogether). I sort of did the same thing; today I just did cardio but tomorrow I have back-to-back workouts in the morning. A good full-body weights session with a quick break to eat a little snack and then I'm off to CrossFit. I'm pretty dang tired, but tomorrow is my last workout before my vacation! I plan to take Thursday as a rest day, but I'm not going to slack off the whole time I'm in Las Vegas. My plan is to workout at least moderately (a little run, some good weight sessions) 4 out of the 6 days that I am there. I think that's totally reasonable, and doable. Ugh, I'm tired. Like full on physically and mentally drained. I think I could sleep for 8 days. I have 2 finals this week and then I'm almost done with classes... ALMMMOOOOSSSTTT there. I move out of my apartment in 3 weeks. There are not enough days in my life. Random observation. The gym I go to is pretty low key. It's more of a rec. center, but they have most of the weights I need. I've NEVER seen another person do squats or deads. It makes me want to hang motivational posters up everywhere. Oh well, more barbell for me . You are all amazing! Krampus, looking totally fit and fierce! Sontaikle, I am too nervous to try handstand pushups. I'm afraid I'll look ridiculous or kick someone... I'm so tall that I feel like I take up so much space... hard to explain. But you are amazing! Jossfit, fierce, as always! Have fun in Vegas!! JossFit, wasn't your wedding yesterday? If so I bet you looked bangin' in that dress! Congrats!! Ugly day friday, skipped my upper workout, BUT I will be back on track! Last edited by pixelllate; 07-22-2012 at 12:37 AM. Funny thing happened yesterday. I had some Old Navy Super Cash and I just couldn't let that go to waste It was $20 off $50. I wanted to get another pair of strangely colored Rockstar jeggings because all of mine are too big at this point. I figured I would need a size 2 because the Rockstar jeans are NOTORIOUS for running a couple of sizes too small and I have Rockstar capris in size 2. It's the reason there are always size 0 Rockstars in clearance. They're too small for anyone wearing an ON size 0 and an actual size 0! Well I was hunting through the clearance and found a pair of BRIGHT purple Rockstar jeans in size 0. They didn't have my size in the non-clearance ones so I was thinking about going to another ON, but I decided to try these on for some reason. They were $15, marked down from $35. Every time I previously tried size 0 Rockstars I could never button them. Uh they fit! What's strange is I'm several pounds heavier than the last time I tried on some size 0 Rockstars! These looked so tiny too. I also found I had to buy kids sizes in a few things because the regular size 0s were too small (I don't mind; they cost less). So I guess this whole eating more and lifting thing is working. Too bad I can't find my measuring tape; I would love to take some measurements. pixellate you are so slim but you look like you can kick some serious ***! Last edited by sontaikle; 07-22-2012 at 10:31 AM. So I have the world's wimpiest triceps. I probably have higher body fat than most active people my height & weight, but oh well, genetics etc. 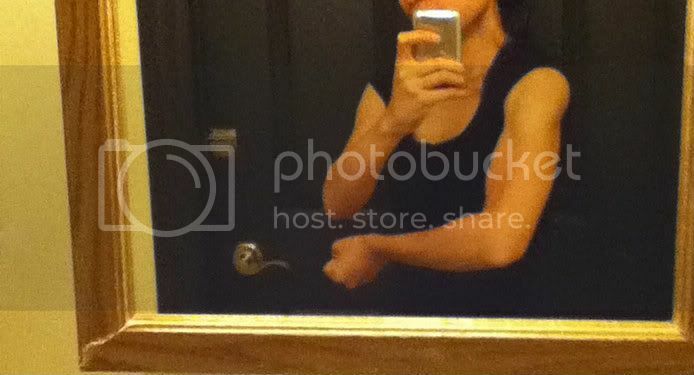 In the past few months my bf has developed HUMONGOUS arms with bulging triceps from maxing out on pushups a few times per week and doing barely any other exercise aside from the occasional jog or hike. He's naturally a big dude and builds muscle easily thanks to being (A) a dude and (B) having worked construction during college, but I'm thinking of adding pushups to my routine on days I don't lift and seeing how this goes. My question I guess is whether you think doing sets of 10-20 pushups a few times a day is "the same" as doing 100 in one sitting or whatever. Thoughts? It's no fair, how boys can build muscle! My husband is the same way. He'll be like "I want to bulk up" and like 4 days later he's gotten crazy huge. I'd think it would be all the same with the push ups. I'm so embarrased that I can barely do them!! I need to work on that too. My fiancé is the same way...and he doesn't even work out. He just has a physical job. Yesterday I think I did somewhere between 55 and 65 pushups. I'm feeling it today! I used to do ONLY pushups for bodyweight strength exercise and I had pretty decent arms/shoulders, so I'm thinking this will be good practice to develop all around strength vs only being good at X specific exercise. I actually did lift 4 of the 5 mornings I was there, the last one being my travel day back home. I am so glad I was lifting while I was there, because it really helped keep me on track! Not only that, but I did look a bit better in my dress with a bit of a pump in my arms! LOL I had a lot of pictures that I loved, but some of my favorites were the ones where I had some good arm action! I'm still catching up on all the new threads and posts here (it's amazing how much goes by in a week!) so forgive me for not getting into all the personals just yet! Jossfit - CONGRATS!!! Looking fierce, woman!!! 40 days until I move. I've been a bit stuck on the scale the last while, again, and it's bugging me. I'm going full on Full30, as of yesterday. The last holdout was dairy and I didn't want to drop my Greek yogurt... but you gotta do what you gotta do. Hopefully something budges this month!! !